Papercrafts by Patti: Pals Paper Arts #91--Buttons!! Clean and Simple Element of Style--Buttons! 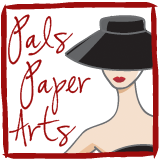 Join us this week at Pals Paper Arts while we are playing with buttons! Any creation you make for this challenge, please upload it to our site using a direct link and you might be "picked" as one of our three favorites for the week. When we had our flower challenge a couple of weeks ago, we had over 100 participants, but we always only pick our top 3 to feature during the week. Wouldn't you love to be highlighted? Then get your button collection out and create!! Can you spy the *new* Baker's Twine on this card? You will be able to purchase this in Early Espresso, Cherry Cobbler and White in the Summer Mini Catalog, which goes live May 1st. If you are in need of any Stampin' Up! products for your projects, please use my Website any time. There are only TWO MORE SHOPPING DAYS to take advantage of Occasions Mini catalog and the Spring is Blossoming promotion. Hurry! Oh, Patti! This is just adorable! I love the soft colors and the delightful details! One of my favorites! Patti this is wonderful, I LOVE those buttons and your layout is fabulous!!!! This DSP is so cute and perfect for this challenge! This is adorable! Great use of buttons. I have to start using hanging tags. I really like the look it creates! Such a cute card, thank you for sharing! !